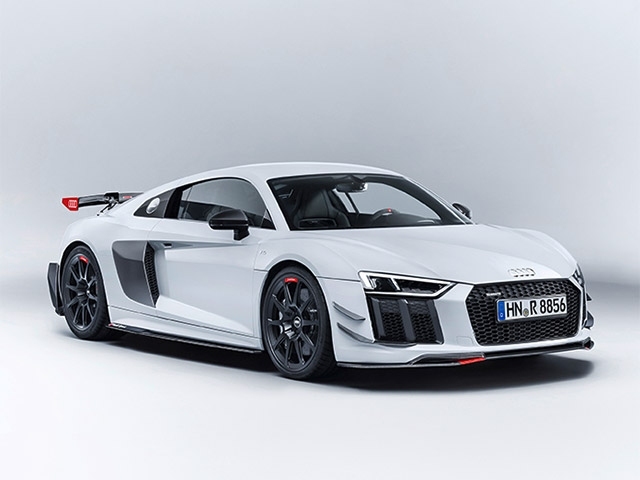 Even more distinctive, sportier and faster: The new Audi Sport Performance Parts take dynamic handling to a wholly new level for the Audi R8 (combined fuel consumption in l/100 km: 12.3 - 11.4*; combined CO2 emissions in g/km: 287 - 272*) sports car and the Audi TT. The retrofit range will be available in dealers in late summer 2017 and features numerous components. 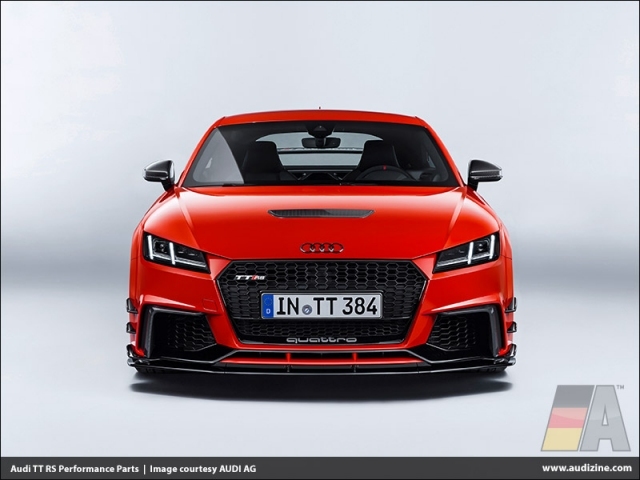 "With the Audi Sport Performance Parts we are tapping into a new business segment," says Stephan Winkelmann, Managing Director of Audi Sport GmbH. 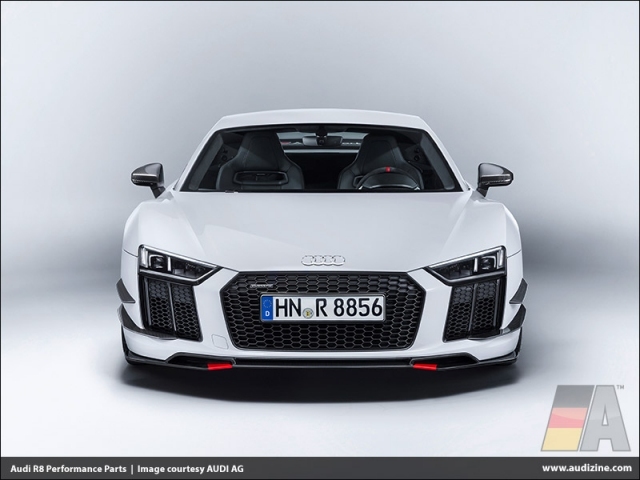 "Our wealth of experience garnered over many years of building sports cars is incorporated into every component we offer. 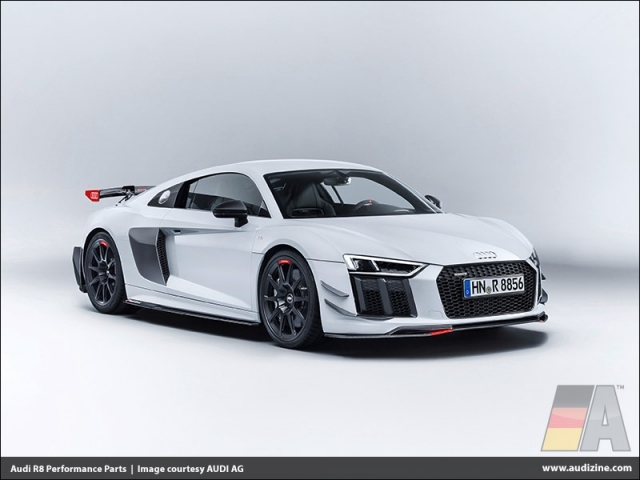 Along with our expertise from motor racing, which is still the best test bed for volume production." 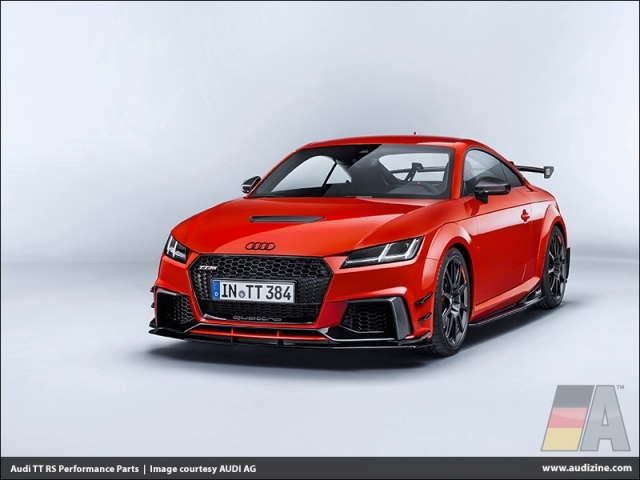 As part of the sales launch of the retrofit range in late summer 2017, the product lineup will initially be available in Germany and other markets for the current Audi R8 and Audi TT models (TT, TTS [combined fuel consumption in l/100 km: 7.5 - 6.7*; combined CO2 emissions in g/km: 173 - 155] and TT RS [combined fuel consumption in l/100 km: 8.5 - 8.2*; combined CO2 emissions in g/km: 194 - 187*]) only. Additional model series will follow gradually. 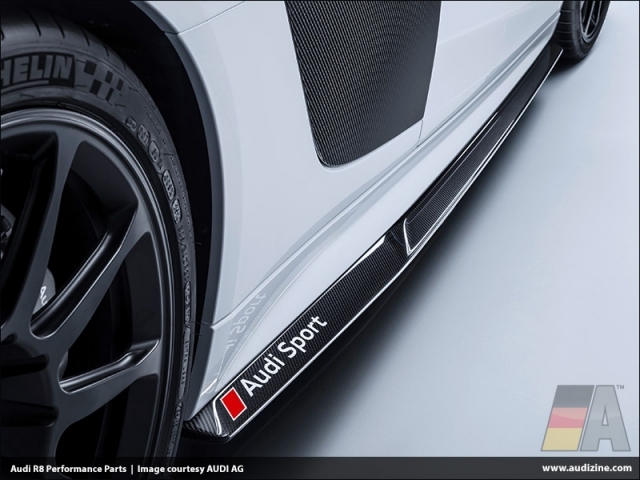 The Audi Sport Performance Parts cover four areas to date: suspension, exhaust system, exterior and interior. 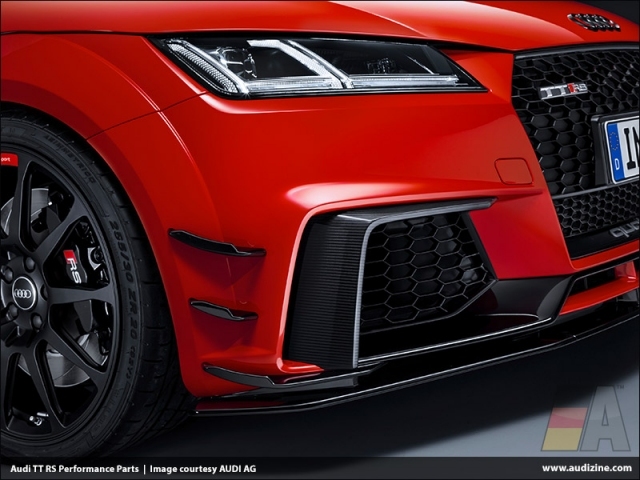 For suspension requirements, the range covers sport brake linings, which are more powerful and less prone to fading than standard brake linings. Linings are available for steel discs and for the optional ceramic brakes. 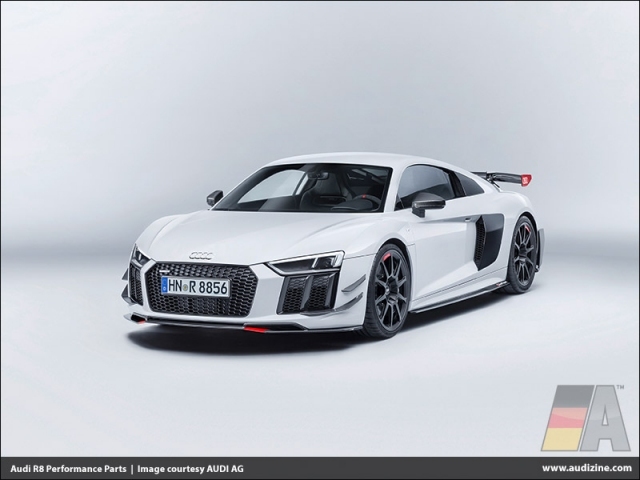 Their carrying plates are painted in fluorescent red and are made out of ultralight titanium on the Audi R8, making this model a kilogram (2.2 lb) lighter overall. 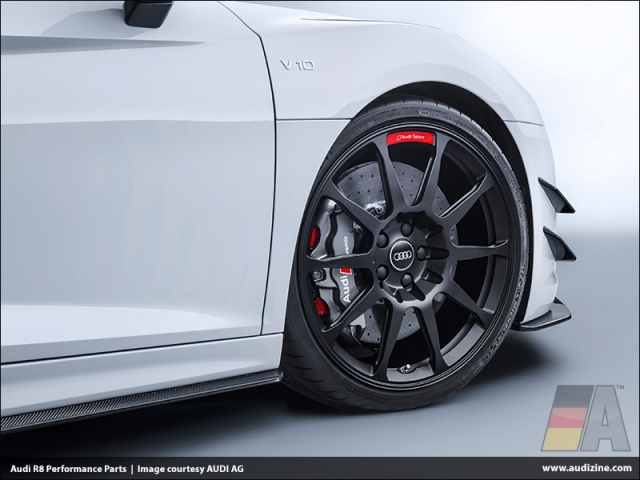 Steel front brake discs with multiple bolt mountings are available for the Audi TT RS. 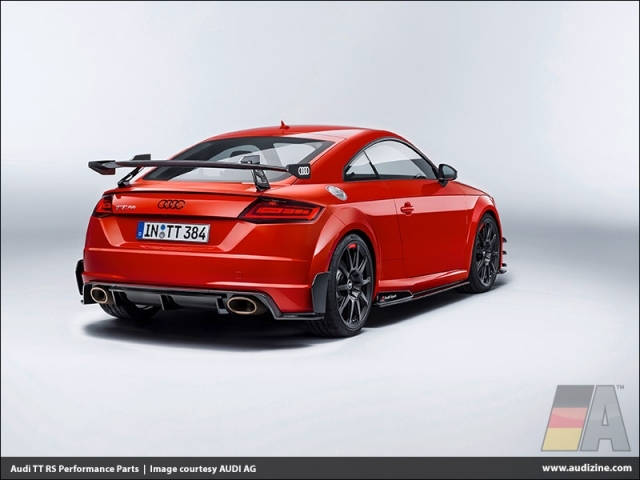 Various brake cooling kits can be obtained for the Audi TT, TTS and TT RS. They help the compact athlete achieve even better braking performance. 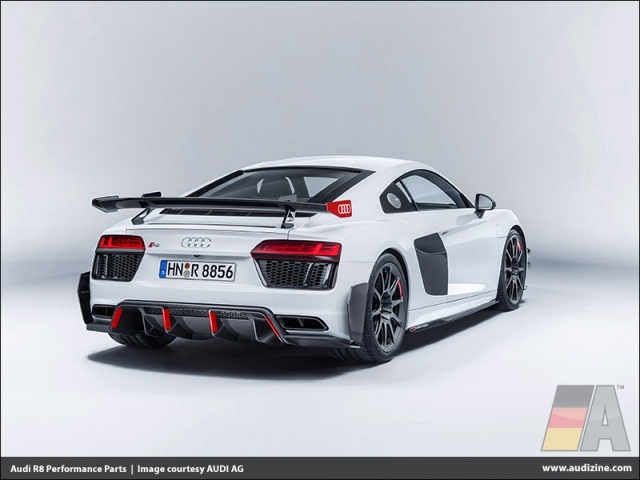 A two- or three-way coilover suspension is available for the Audi TT models and both Audi R8 variants. 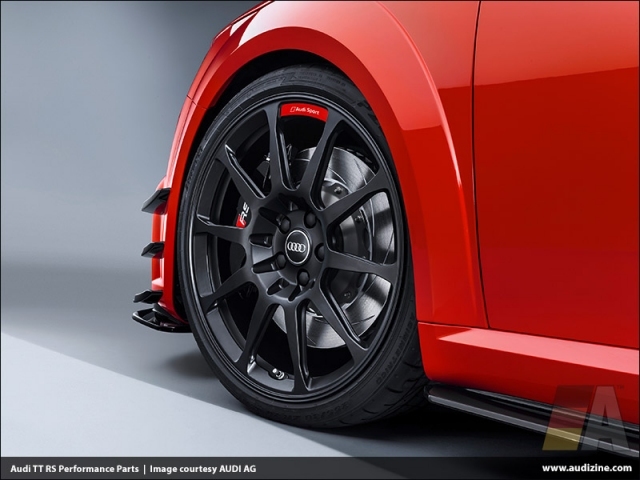 The fully milled, black 20-inch wheels - for all R8 and TT models too - are also taken straight from motor racing. 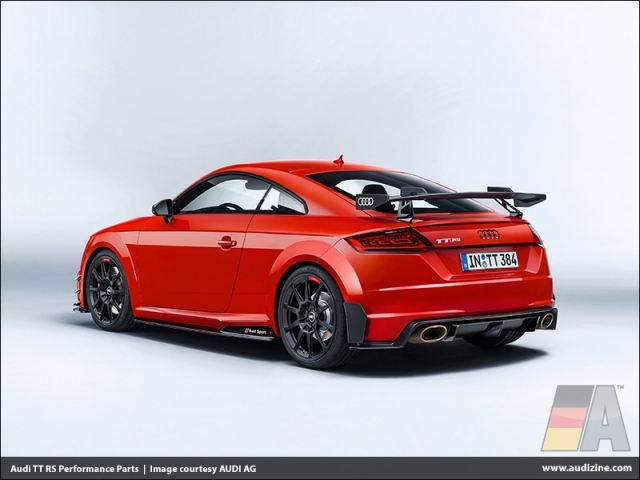 They reduce weight by up to 7.2 kilograms (15.9 lb) on the Audi TT and up to 8 kilograms (17.6 lb) on the Audi R8. 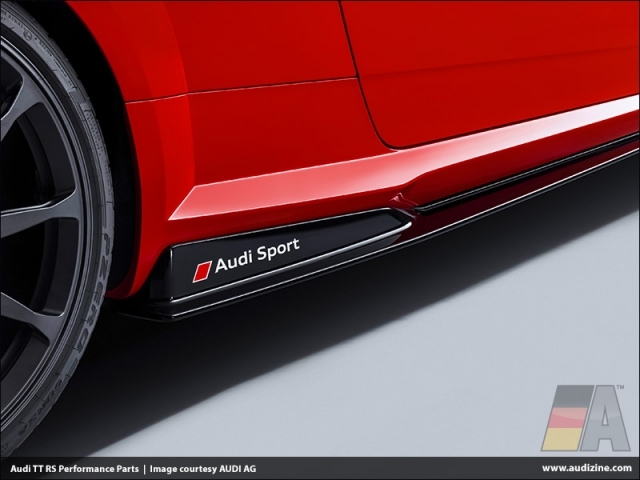 The associated sport tires come in the sizes 245/30 R20 (R8, front) and 305/30 R20 (R8, rear); 255/30 R20 tires are fitted all round on the Audi TT. 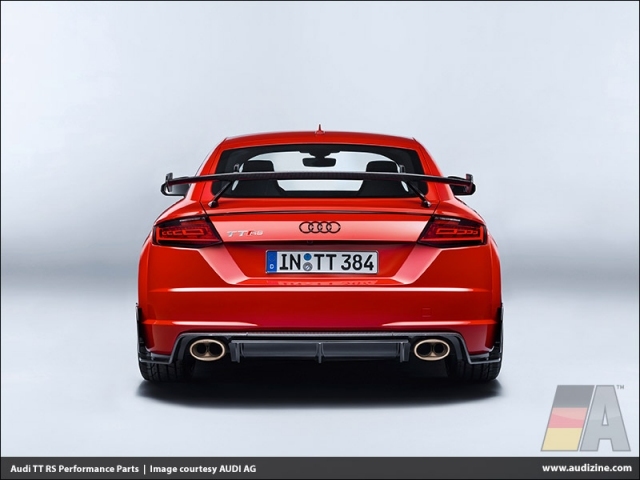 For the TT coupés with quattro drive, the retrofit range includes a cross-member reinforcement bar on the rear axle. It improves rigidity and makes handling even more precise. 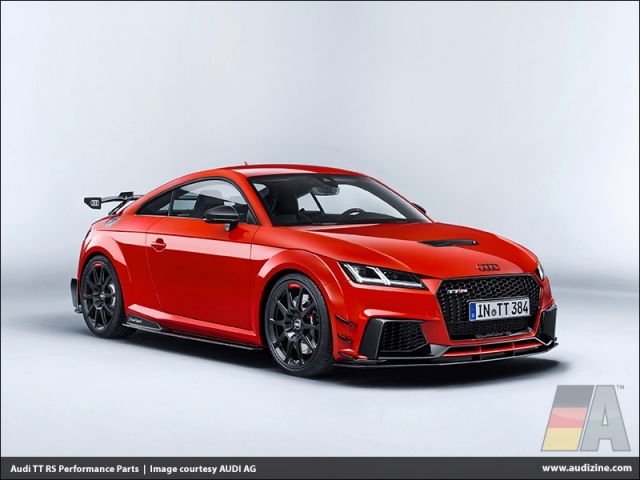 Audi TT RS owners can also subsequently increase their car's top speed to 280 km/h (174.0 mph). 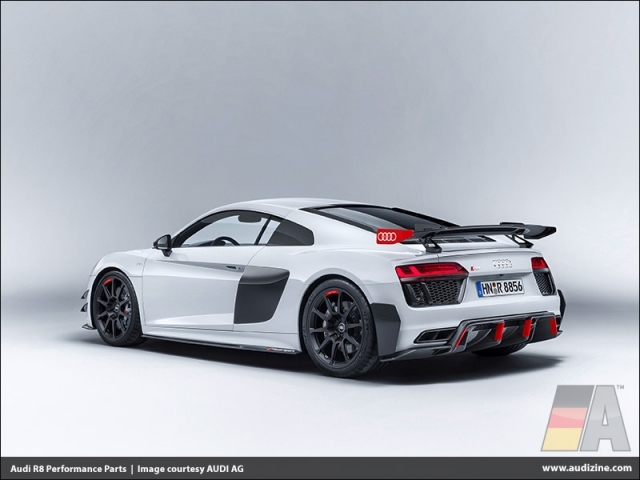 The specialist supplier of exhaust systems, Akrapovic d.d., has designed a sonorous, ultralight muffler made of titanium including trims specifically for the Audi TTS and the Audi TT RS. 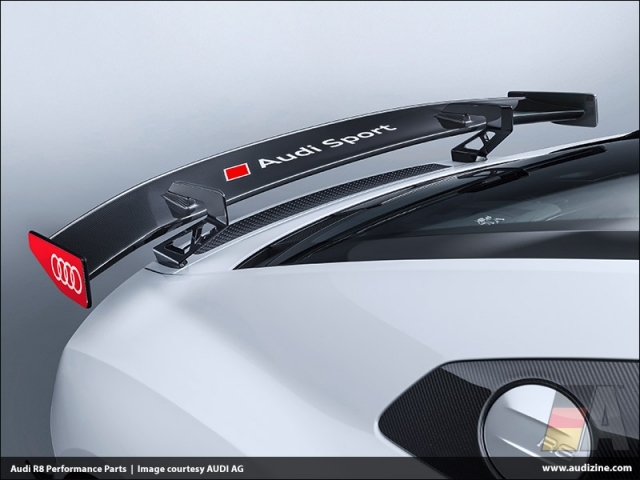 The most spectacular offers in the Audi Sport Performance Parts are the Aero kits, which were developed in the Audi wind tunnel. 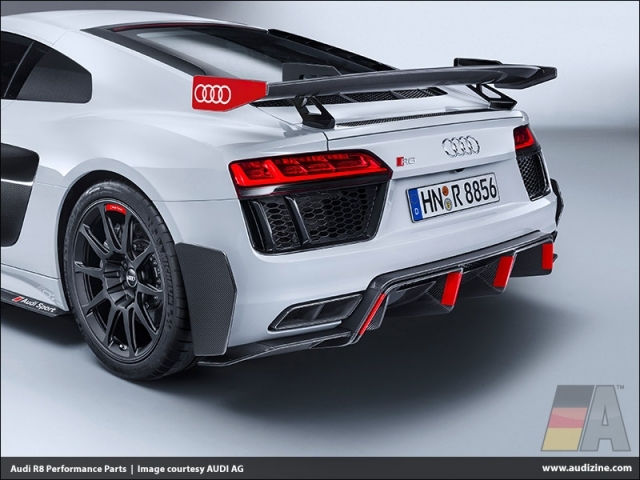 For the Audi R8 and the Audi TT they add clear-cut highlights on the front air inlets, the side sills and the diffuser. 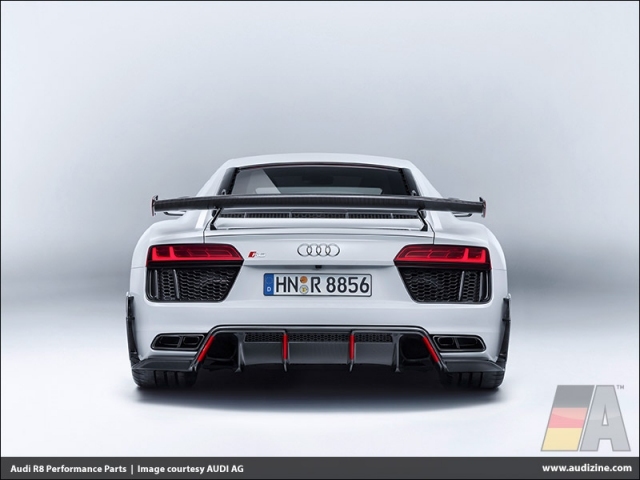 They also substantially improve downforce: On the Audi R8 the downforce is 250 kg (551.2 lb) at 330 km/h (205.1 mph), an increase of over 100 kg (220.5 lb). The effect at 150 km/h (93.2 mph) is even more pronounced - the downforce is doubled at this speed to 52 kg (114.6 lb) thanks to the Aero kit. There is also a splitter and flics at the front as well as a large fixed rear wing. 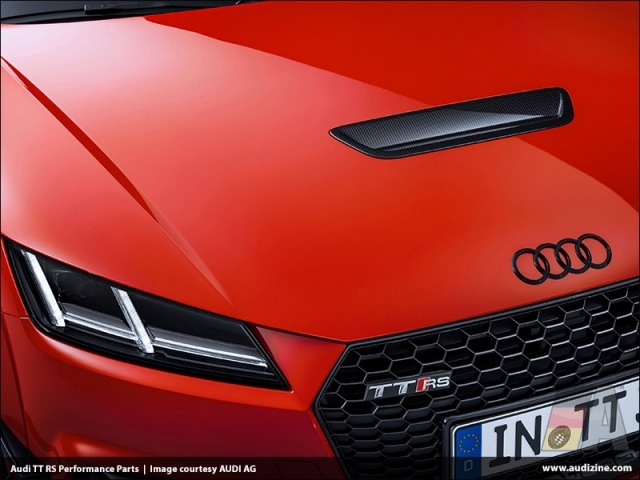 An engine hood with large air vent is also available for the Audi TT. 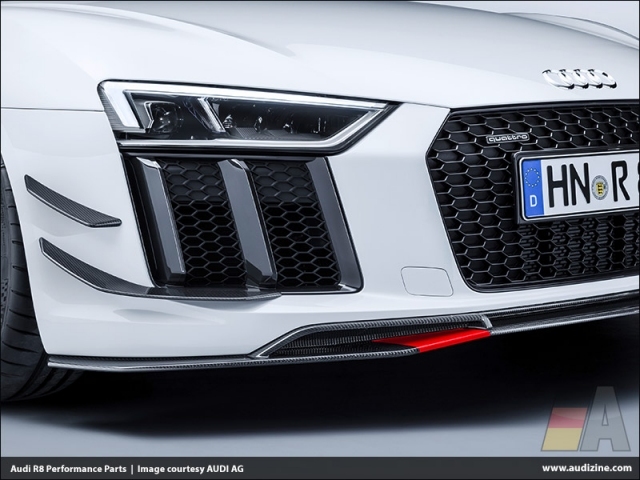 All parts are made out of carbon fiber-reinforced polymer (CFRP) for the Audi R8 and for the Audi TT out of CFRP and plastic; all of them feature the Audi Sport logo. Attractive parts for the interior round off the range. 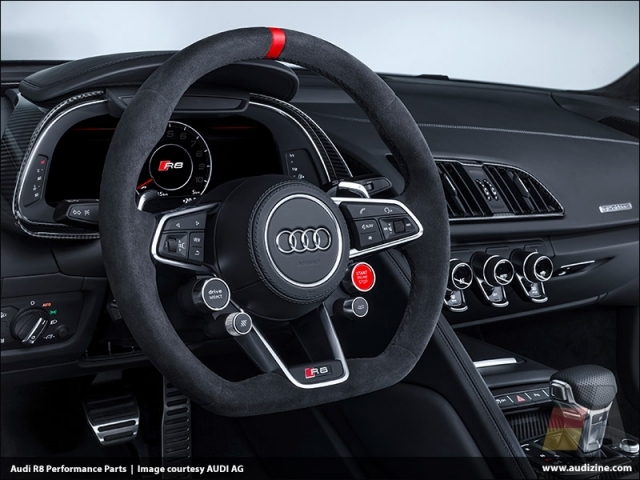 A sport contour steering wheel with multifunction plus is available for the Audi R8 and for the Audi TT; its Alcantara-trimmed rim features a red 12 o'clock marking. 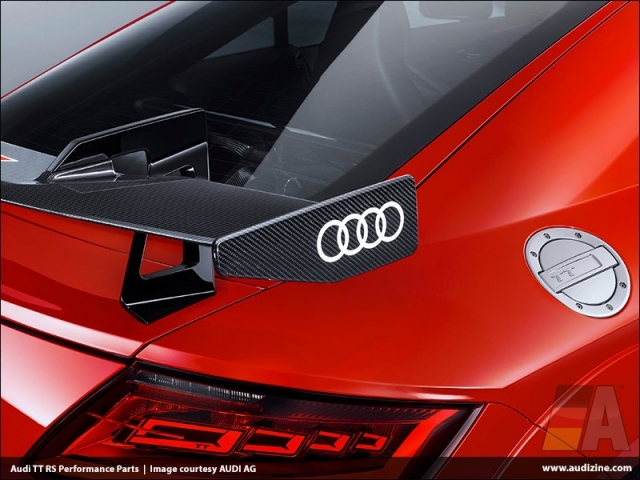 CFRP shift paddles are available for the models fitted with seven-speed S tronic. 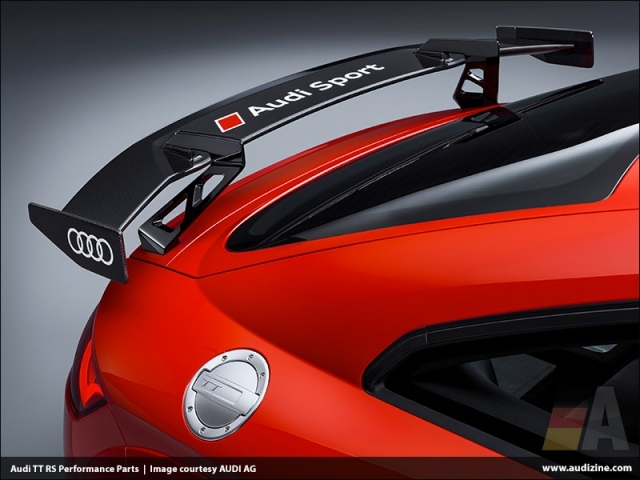 Audi Sport has developed a strut cross brace specifically for the TT - also made out of CFRP. 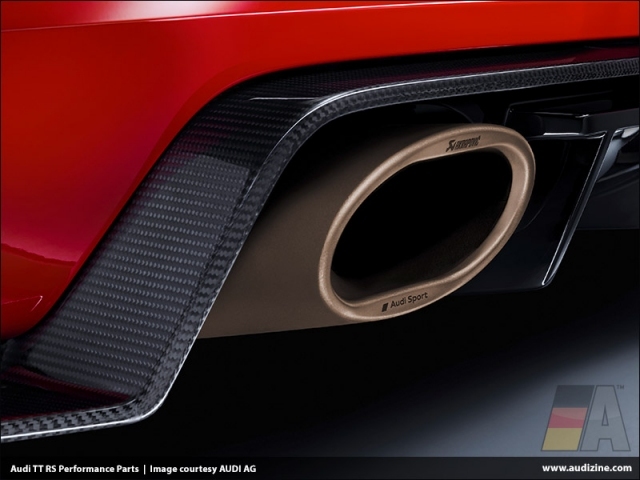 It replaces the rear seats, reduces the weight by some 20 kilograms (44.1 lb) and enhances the torsional rigidity. The brace improves handling particularly when cornering at speed.